Elegance and grace should be the words that best describe her... During her long acting career, Audrey Hepburn carried out a life with both style and purpose. 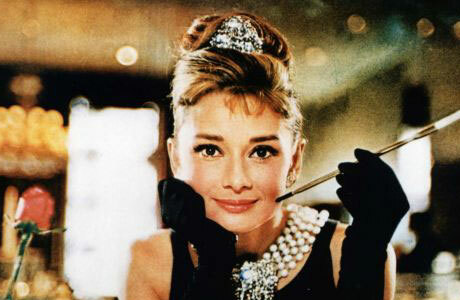 Hepburn was 32 when she performed in the stylish romance, Breakfast at Tiffany's (1961), that adapted from Truman Capote's book of the same name. Although Capote wanted Marilyn Monroe for the role, however, after producers got "will not play a lady of the evening" from Monroe's personal acting coach, Audrey Hepburn was chosen for the role Holly Golightly, jet set socialite, free-spirit lady who loves parties, window shopping on Manhattan streets and makes a living through the company of rich men. Hepburn later calls her role "the jazziest of my career". Between the iconic beginning of the movie and its unforgettable dialogues, as we learn more about Holly, we see Hepburn in a lonely, wants-nothing-but-love character and maybe relate the untouchable and sophisticated Hepburn with this girl. However, the biggest fault of the movie, which was subjected to many criticisms, is the japanese character, Mr. Yunioshi, the neighbor of Holly. Although there is this unfortunate racist portrayal of Asian community of America in 1960s, the part which Hepburn sings "Moon River" in a dreamy atmosphere is nothing but radiant and the most memorable moment of this romantic comedy.